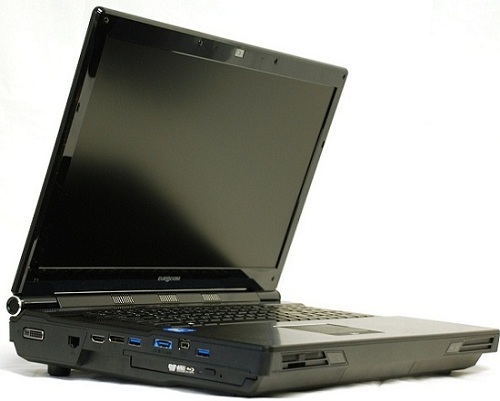 Eurocom Corporation (www.eurocom.com) , a leading developer of high performance Mobile Workstations and Fully Customizable Notebooks launches a computer system with full server capability combined with full mobility. Unlike conventional servers the EUROCOM Panther 5.0 Server Edition weighs just 12lbs/5.5kg and is equipped with an integrated keyboard, 17.3” LCD Display, touch pad and Uninterruptable Power Supply (Battery Pack). The EUROCOM Panther 5.0 Server Edition is a new category of heavy duty Intel Xeon based super-computer class laptop designed for Server On-the-Go deployment. It is powered by Intel's family of Xeon E5-2600 series 6- and 8-cores processors, capable to deliver server class performance in a small and compact 12lbs/5.5kg package running major Network Operating Systems such as Microsoft Server 2000R2 or Server 2012, VMware Workstation, VMware ESXi and Red Hat. Panther 5.0 Server Edition is an All-in-One server solution complete with integrated keyboard, 17.3” LCD Display and built-in UPS (Uninterruptable Power Supply). “The Panther 5.0SE is perfect for organizations relocating operations that require fast network setup to eliminate staff downtime. To startup companies having an entire network server, for 20-50 users, running in one box. We also have customers who use our mobile servers as backup in case their production server goes down, they can load the virtual machine on to the mobile server for production purposes while the main production server is down. The more professionals we speak with about the Panther 5.0SE the more creative and beneficial uses we see” Mark Bialic, Eurocom President. EUROCOM Panther 5.0SE uses quad channel memory, and enables the Panther 5.0SE to initially support up to 32GB of DDR3 1600MHz RAM via four 8GB SODIMM 204 pin modules. With such massive amounts of RAM available, the Panther 5.0SE becomes a great tool for virtualization and server class environments. The system is capable to support 64GB - this option will be available in the future once memory vendors release their 16GB single SODIMM module design. For applications that require massive storage or high-throughput data recording, such as network packet capture or high-speed data acquisition, the Panther 5.0 supports four Solid State, Hard Disk, or Enterprise level drives with RAID 0,1,5,10 capability. With support for up to four 1 terabyte storage drives, the Panther 5.0 is able to offer 4 terabytes of storage. RAID 0,1,5,10 capability gives users the ultimate in performance or redundancy. SSD drives in particular will benefit from the use of the SATA 6Gbp/s standard, eliminating bottlenecks for the fastest SSD drives. For the most demanding customers, Eurocom offers the highest performance Intel and Micron SSDs including the new Intel enterprise SATA 6Gb/s Intel DC S3700 800GB HET MLC SSD. The addition of an optional Blu-Ray drive allows users to backup data by burning important data to large capacity Blu-Ray disk drives. The optical drive can also be swapped for an additional storage drive. Additional external storage can also be connected to the Panther 5.0SE through the eSATA port. The Panther 5SE comes with an Intel® 82579V Gigabit Ethernet port for greater compatibility with modern server operating systems such as Windows Server 2008 R2 and Server 2012. Additional LAN capability can also be added via the ExpressCard slot for up to three LAN ports, or a quad port LAN through the MagmaExpress Box. Additional LAN capability can be added through the ExpressCard slot itself, while also allowing connection to a MagamExpressBox for even greater LAN capability and VMWare ESXi compatible Ethernet Server PCIe cards. Fibre Optics capability can also be added through the ExpressCard Slot. The expandability of the Panther 5.0SE allows it to accommodate additions to its capacity and capability. The ExpressCard technology is designed to deliver high performance, modular expansion. The Panther 5.0SE is able to accommodate wired and wireless communications, multimedia and security features through the ExpressCard slot. The Panther 5SE also supports storage expansion through the Optical Drive bay as it can be swapped out for an additional storage drive or can be used to backup data through the BluRay burner. Storage can be expanded through the eSATA port to an external storage medium as well. Mobile broadband capability (3G, 4G,) can also be added through ExpressCard for wireless internet access on the go or for Ethernet Network Analysis. With the plethora of professional grade components the EUROCOM Panther 5.0SE can run the most demanding Operating Systems with ease, such as: Windows Server 2008R2, Windows Server 2012, Ubuntu, Red Hat and VMware Workstation. The Panther 5.0SE can run VMware ESXi with a MagmaExpressBox and a VMware ESXi compliant LAN adapter within, and can also support fiber optics via ExpressCard 54 slot.